QSL cards are similar to postcards. 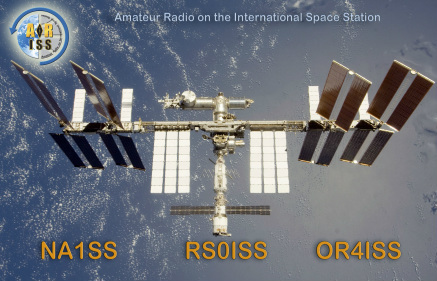 Radio Amateurs, often called "hams," exchange QSLs to confirm their radio contacts with other stations. 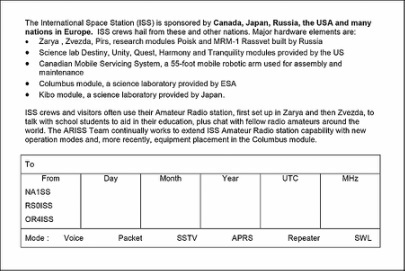 Participating in ARISS is an exhilarating experience, but waiting for a coveted QSL card documenting the contact requires patience. Please send your QSL report by mail to the address of the office listed below for your region. Include in your QSL report: date, time in UTC, frequency and mode (voice, packet or sstv). If you wish to receive a card, you must include a self-addressed, stamped envelope with proper postage or with sufficient International Reply Coupons (at least 2 IRCs). Email addresses listed below are provided for inquiries only-- you must apply for QSL cards by mail.